Post-Script: Word-whittled on the front porch, on a cold but sunny day, with the little Brother Webster XL-747. An assemblage of individual keystroke experiences piling up at my feet, along with cigar ash. This piece was transcribed (i.e. retyped) via SCM Galaxie Twelve. Transcribing isn't writing. It's mechanical. Errors will be made. Errors were made, evidenced by subtle but obvious white correction tape markings on the yellow-green paper. I obviously need more meditative word-whittling practice. Top photo inspired by artist and writer Austin Kleon. You stand in line at Customer Service, adjacent to the entrance. Nearby there's a cloistered foyer-like area between two sets of automated doors, where shopping carts are corralled, awaiting their customers like steeds their cowboys. Next to Customer Service, in front of the automated doors, in an open area seemingly too empty, representing potential wasted retail square footage, not even a display kiosk, stands a security officer. He appears to be just a few years out of high school. Fresh-faced, tall and skinny; hardly intimidating to the type of person who might be inclined to commit crimes on the property. I'm here in Customer Service because I need to exchange an item purchased the previous week. There are three people in line ahead of me. Behind the counter, a middle-aged lady is tending to the line while two others are seemingly supervising, at least according to their badges. Behind them, there is a sign on the wall with the eery message Blood Disposal, below which is a dispenser of biomedical hazard bags. Adjacent is a return bin labeled Celebration. I find myself amused by the dichotomy of this found phrase, Blood Disposal Celebration. This could be a good band name, or title of some experimental video. These are the thoughts that come to you while waiting in line at the neighborhood Walmart Customer Service. Other than the blue vests and ID badges, it would be difficult to tell the employees apart from the customers. There is a kind of default civilian attire on display by both classes, casualness bordering on grungy, a kind of grunge so authentic as to make the most acute culture-maven pine with jealousy. I ponder the dichotomy of the fashion-conscious who seek out authenticity in appearance by appropriating the cultural artifacts of a socio-economic strata completely foreign to them. Here, the casual grunge is not an affectation but an artifact of hard economic reality. I ponder that thought, as I slowly shift my weight from one foot to the other, and back again, tending to a careful balance between impending impatience and a purposeful attempt at keeping my attitude at bay, taking the high road, reminding myself that standing in line is a rather normal anti-activity for dense populations in the civilized world. I remind myself that I am an accomplished line-stander from way back, so far back as to pre-date the terms "old school" and "back in the day". This too shall pass, I tell myself. The line barely moves. I can almost sense the lights momentarily dimming, but am not certain; maybe it's just me. I have visions of cloaked, huddled masses of Slavs, partly obscured by sleet and snow, standing in some Soviet bread line, grim determination their only solace. Perhaps it's not that bad, I tell myself. Or maybe, I ponder, perhaps the Customer Service line at the neighborhood Walmart is our own kinder, gentler form of Soviet bread line. I find a strange comfort at that thought. The line still barely moves. 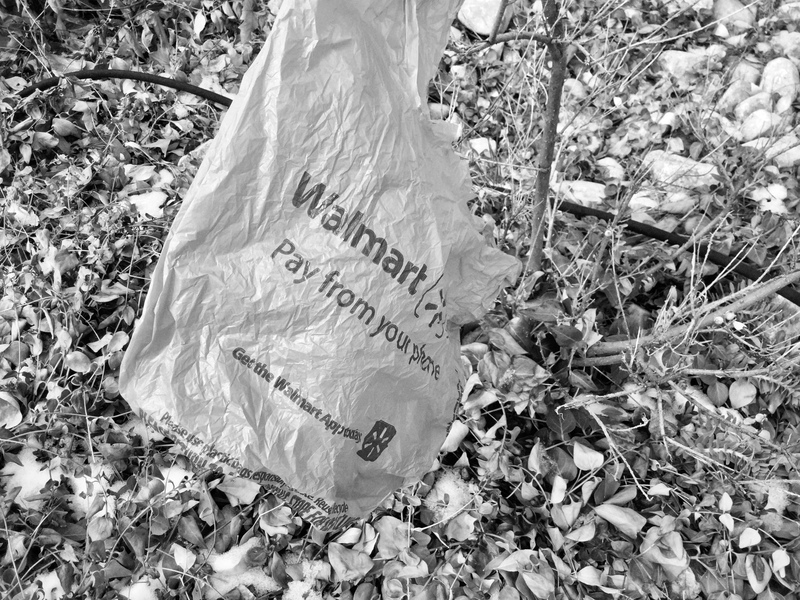 Eventually, as each customer is attended to, their returned items are packaged in one of those ubiquitous gray plastic Walmart bags - the kind that eventually become part of the landscape, snarled around tumbleweeds in an adjoining vacant lot - which are then stapled shut and tossed in the appropriate bin behind the Customer Service desk, piled high with other identical gray plastic bags, for some other nameless, faceless soul to restock. I can't imagine what it would be like to have the job of restocking; and yet, if you walk into any 24-hour Walmart, late at night, you might be witness to those ghastly silhouettes of the doomed, frantically restocking shelves. You wonder what form of hell this must be, what crimes were committed that this punishment would be meted out upon these tortured souls; until you suddenly realize their labor is self-inflicted, fueled by hard, cold economic reality. Jobs are hard to come by, out here in the badlands. I check my watch and the second hand has barely moved. Other people behind me in line are twiddling at their phones. Me, I have a flip phone and try not to feel too superior. It's almost my turn at the Customer Service desk, and another employee is making subtle motions implying a second station might be readying to open; you never can be too certain about these things - only God and the shift manager know for certain, and neither are telling. Should it open while I'm still in line, I'll have to decide which station to choose. Each choice has some risk. If I choose the newly opened station, does that signal my impatience with the middle-aged lady at the first station? That I'm meting out my exasperation by snubbing her? Or, if I choose her station instead, does that mark me as stoic and inflexible; that, damn it, I made my choice and I'm sticking with it? Is it a signal to the other employee that they took their own sweet time opening up a second station, ignoring us poor saps in line, so to hell with you? Yes. Maybe. Actually I'm not certain, but now it's becoming less important because there's only one guy in front of me, with a shopping cart containing some partially wrapped contraption-like thing that looks entirely out of place here, like it could not possibly have been sold in a Walmart, but instead some secondhand junk truck stop bazaar, something long and gangly and coiled up, with a tinge too much patina and wear to have been purchased recently new. I begin imagining some gang of thieves who hock their booty at the neighborhood Walmart Customer Service in exchange for cash or credit. I begin imagining some one-offramp town near the interstate highway where the local Walmart has put all the other local businesses into receivership; and everything that every person in town owns and wears, aside from major appliances and automobiles, is purchased under that one roof, and how can they, like the tall, gangly security guard man-child, tell if a customer has shoplifted if everything they're wearing, from shoes to jewelry, was purchased there? I begin thinking of a wallet or purse stuffed to overflowing with receipts for everything one wears. I begin thinking about thermally printed cash register receipts and their intrinsically short lifespan before the paper begins to fade. I begin thinking that perhaps this is intentional, as I gaze into that internal maw of limitless conspiracy musings. I purposefully have to shut the door on my inner paranoia. The guy in front of me, he's struck up a conversation with a lady in front of him, who I thought was his wife but now I'm not so certain, their intimacy seemed too overt for having just met in line; but then I begin to wonder, how long have we actually been in line, that they had time to become acquainted and intimate, and is this the new form of dating venue, instead of singles bars, meeting someone in the Customer Return line, and suddenly I realize I'm next in line and I have to make my choice. It is only ten minutes later but feels like a lifetime. I'm now walking out through the automated glass doors into the bright daylight, partially filtered by clouds and a blustery, cold wind, into the vast parking lot that faces toward the south, my favorite direction because the vista is so sun-lit, so replete with possibility and the warmth of hope. I think I know which row I parked in, but suddenly don't recognize the rear of my vehicle until I'm almost upon it. I begin to notice that many of the vehicles around me look newer, fancier, except for some stand-out beaters that now sport a new-found patina of appreciation. I press the button on my key fob and that familiar chirp reminds me that my errands are not yet complete, but that I have survived for another day the Customer Service line at the neighborhood Walmart, and I am perhaps the better for it, but am not entirely certain. Y'all probably know this feller by the name of Casey Neistat. YouTube blogger. Co-star of MTV's The Neistat Brothers series. Skateboarder. Drone flier. Father. Husband. New Yorker. A self-made person. He's doing well enough that he probably doesn't need me promoting his videos. But I've linked his Valentine's Day video above, a love-letter to his wife Candice, because it was sweet. And it prominently featured a Brother ML100 electric typewriter. I liked the sound of the staccato rhythm of his electric Brother through out the video. And as a typewriter collector, I also like the idea that, for Casey, he's not a fetishist or collector. 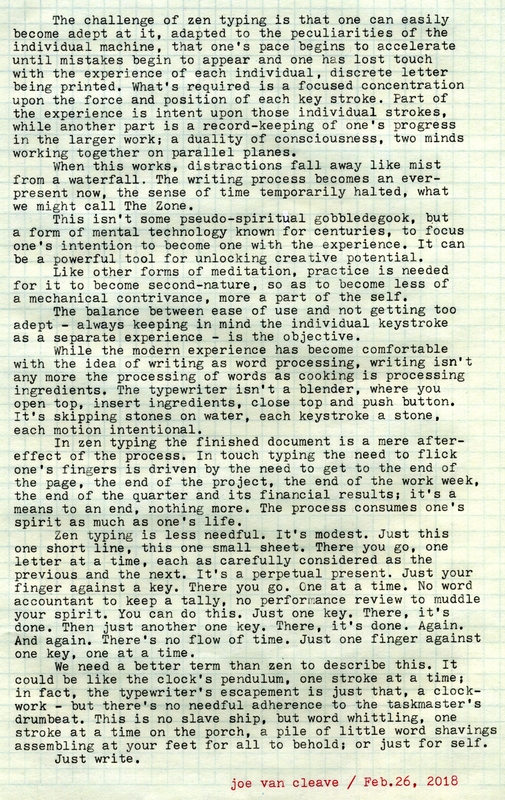 For him, it appears that an electric typewriter is just a practical tool. Like all the other practical tools that adorn the walls of his studio. That's cool, and refreshing. If I wasn't such a typewriter nerd and collector, and didn't like manual typewriters so much, I too might be happy with just one machine, a modern-day electric daisywheel "wedge". 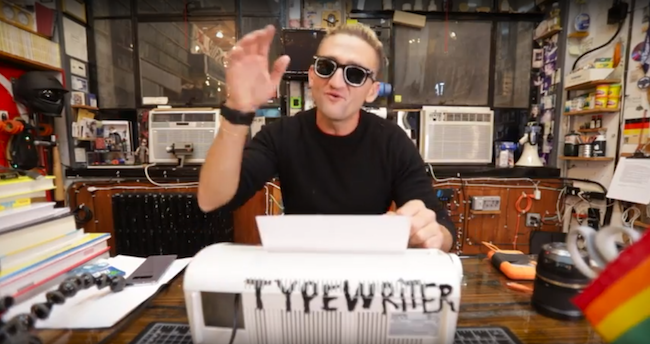 I don't want to over-analyse Casey's video too much, but I liked how the typewriter, a not-nearly-as-glamorous-machine-as-a-black-and-chrome-manual-from-the-1930s, was the perfect tool for writing a love letter, which he then folded and placed in an envelop. He could have - if he had a printer - word process the crap out of a love letter. Or pen it by hand with quill and bottled ink. Unless his penmanship, like mine, is sorely lacking. 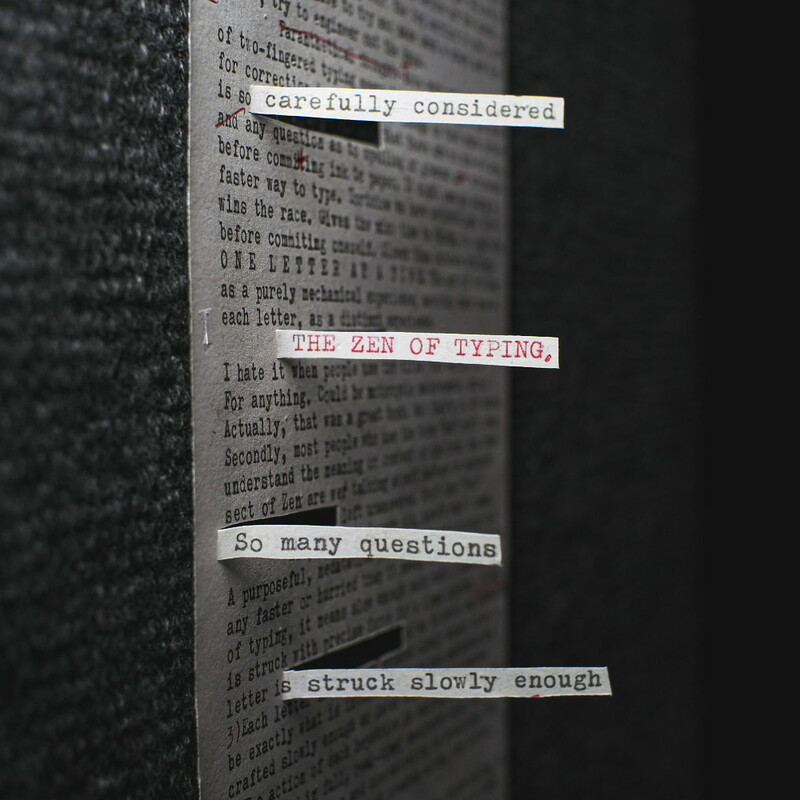 Typewriters were made for people like us. Casey's video, I'm certain, will garner millions of views. 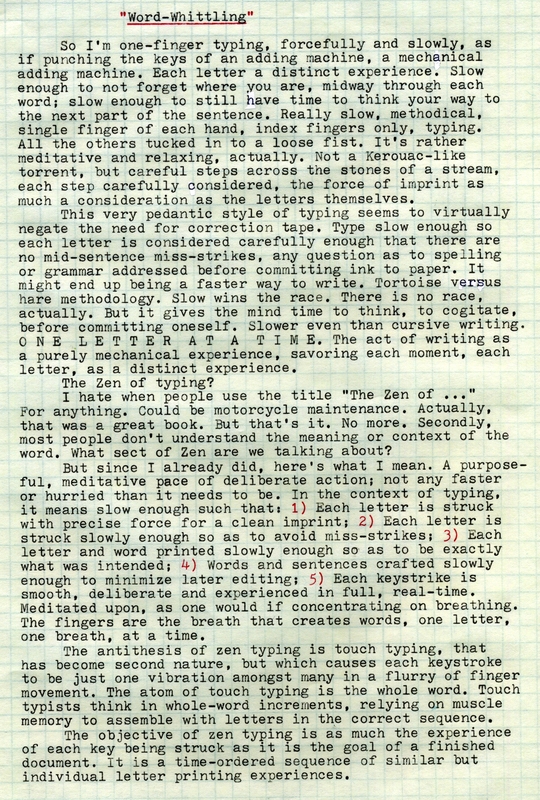 And those millions of people will be witness to the eminent practicality, in 2018, of a typewriter in one's home, office or studio, a tool ready to do the work of printing directly to paper a brief document, like a love letter.